This is a sample acetate fiber from the sample-set provided by Textile Fabric Consultants, Inc. Chromspun is a trademarked product of the Eastman Chemical Company. 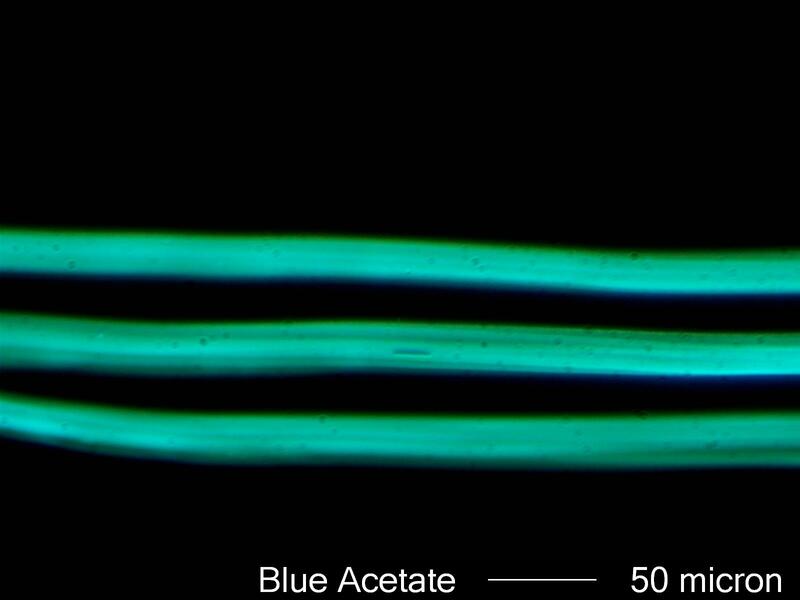 The blue color is the result of a dye used in the fiber. The low birefringence and small diameter of the fiber would result in a pale bluish gray interference color if the dye were not present. Acetate fiber is a cellulose derivative. Wood cellulose or cellulose from cotton linters is often used as the starting material. It is formed by drawing the cellulose solution through a spinneret into an acid bath where it solidifies from the outside in. This results in the crenulated cross-section because the outside polymerizes first and is drawn more rapidly though the bath than the interior of the fiber that is still liquid. The draw-rate affects the fiber diameter and the degree of crenulation. Acetate fiber was commercially produced starting in about 1929. Acetate has a refractive index along its length of about 1.47 to 1.48 and perpendicular to its length of about 1.47 to 1.48. It has a birefringence of about 0.004 or lower and a negative sign of elongation. It exhibits irregular striations along its length due to the crenulated cross-section of the fiber.